Please refer to our stock # be109r when inquiring. 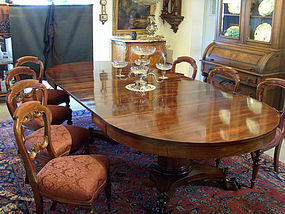 Solid split pedestal mahogany dining table made by Brown and Simpson of Boston in 1909. It measures 54 inches round by 29" tall when closed. There are six leaves, two with aprons. When opened with the two leaves that have aprons, it becomes an oval measuring 6' 3" inches long and looks like one large table as the center pedestal stays closed and the aprons make it look like there are no leaves. When fully opened with the 6 leaves, the pedestal splits and the table measures 9' 9" long. There are great paw feet at its base. This lovely table is in perfect condition and would be a great show piece in any dining room.